The Native Americans of the great plains believe that the air is filled with both good and bad dreams. Historically, the dreamcatchers were hung in the tipi or lodge, and also on a baby’s cradle board. Legend has it that the good dreams pass through the center hole to the sleeping person. The bad dreams are trapped in the web where they perish in the light of dawn. 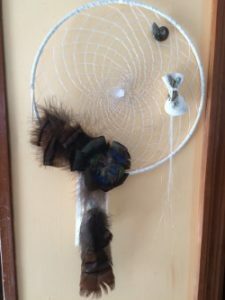 Dreamcatchers come in a variety of hoop sizes and trims. Creations include various crystals, feathers, colors of leather, and weaving, plus, different trim designs. 2-1/2″diameter with Drum on Reverse Side, Feather Trim. 4-1/2″ bag with Herbs inside and Bead trim. A Handmade metal hoop wrapped with leather, 8 strands of imitation sinew, Animal Medicine, very large shell, crystals or semi-precious stone.